None of these suggestions are specific recommendations for your horse; we have compiled a list of medications which some clients have used successfully for horses with headshaking under the direction of their veterinarian. All medications have potential side effects. 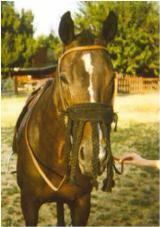 Always consult directly with your veterinarian before giving any medications to your horse. The information below may not be copied or distributed and is for your consideration only to discuss with your veterinarian. If you wish to support our headshaking research please consider a donation by making a check to ‘Regents of the UC’ and send to Dr. Madigan, Dept of Medicine and Epidemiology, Tupper Hall, School of Veterinary Medicine, University of California, Davis, Ca 95616. Enclose a note saying that the donation is 'for support of Dr. John Madigan's research.’ These are considered tax deductible donations. Our aim is to determine the exact cause and a specific cure for this condition. Note: all of these drugs may "test" in competition horses. These drugs do not correct the cause of headshaking, they are used as an aid to controlling the nerve pain associated with headshaking. Madigan, JE and Bell, S A Owner survey of headshaking in horses. Journal of the American Veterinary Medical Association 2003; 219: 334-357. Potential adverse reactions should be discussed with your veterinarian and can include all of the adverse effects listed for cyproheptidine above. The side effects listed above, although rare, can be VERY SEVERE/DRAMATIC and can be DANGEROUS to you and your horse. This requires immediate veterinary attention. Spirulina wafers orally – Spirulina is another supplement that may help decrease stimulation of the trigeminal nerve. You can find Spirulina wafers online from Springtime Inc (http://www.springtimeinc.com). Please dose according to the label on the bottle. The Equity vaccine was the focus of a joint study conducted by veterinarians from UC Davis and Massey University published in December of 2010. In this study conducted by K. J. Pickles, J. Berger, R. Davies, J. Roser and J. E. Madigan, 19 horses in New Zealand and the United States received two doses of the Equity vaccine, a GnRH (a hormone) vaccine. The study found that "although some of the owners perceived a subjective improvement in their horses’ headshaking behavior, repeated owner evaluation scoring did not demonstrate a beneficial effect of GnRH vaccination." Based on this study we cannot recommend the use of this vaccine at this time. There are four basic categories of treatment available to your horse. Physical and dietary adjustments are the easiest to make, so we will discuss these first. We recommend including your veterinarian in the decision making process when making a change to your horse's diet or supplement regimen. These methods are the easiest to try and you can use them in combination with any of the other treatments (dietary and drug). We highly recommend trying these individually and in combination, as each horse will respond differently. The drug therapies listed below may not be appropriate for your horse. All drug therapies have potential side effects. In order to ensure the safety and wellbeing of your horse, it is very important that any drug treatment be discussed with, prescribed, and monitored by your veterinarian. These are not recommendations, they are simply a list of drugs that veterinarians have prescribed to treat headshakers. 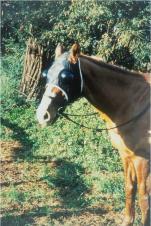 Mills, D. S., Taylor, K. Field Study of the efficacy of three types of nose net for the treatment of headshaking in horses. Veterinary Record 2003;152:41-44. In one study, one in 28 headshaking horses responded to chiropractic treatment. In one study, four in 25 headshaking horses responded to acupuncture treatment. Allow mild weight loss and continue exercise. In the past a low protein diet may have been recommended, we no longer recommend lower protein intake, only mild weight loss. This treatment will take considerable time to show improvement. Maintaining a healthy weight for your horse is of particular importance if it is a headshaker, as overweight horses are over-represented. Melatonin: this treatment tricks your horse's body into thinking it is a different time of year (alteration in photoperiod) and is useful for some seasonal headshakers). This treatment is most effective with headshaking that starts in the spring. 12 mg-18 mg melatonin orally starting Nov 1st given every day at 5:00 PM. Give 15 mg (average size horse) - 18 mg (larger horse) of melatonin orally (five -six 3 mg tablets) every day at 5:00 PM. It is important that the tablets are given at 5:00 PM to correlate with the naturally occurring rise of melatonin with onset of darkness at 5:00PM in the wintertime. For best results give this dose at 5:00 PM all year round. It is very difficult to manipulate the photoperiod, and administering the dose year round will increase the likelihood that this treatment is effective. Horses on melatonin therapy may not shed their winter coat. These horses may need body clipping. Magnesium: magnesium is an electrolyte critically involved in nerve function. Supplementing the diet with magnesium may help decrease the stimulation of (quiet) the trigeminal nerve. This product is available as a powder and is measured in 10 gram servings. Start treatment with 2 servings a day. If no improvement is seen in 2 weeks, increase treatment to 4 servings per day. When Dr Madigan was on sabbatical in NZ in 2005 he continued to work with horses with headshaking there. He met many horse owners struggling with headshaking horses. Over the past two years several NZ horse owners told him their horses headshaking improved when given Top Stock Heasdshaking Formula. We have completed a small owner evaluated clinical trial (without controls) and found that 7 of 10 horses with headshaking improved to some degree while receiving this product. Improvement usually started within a 1 week time frame. Further studies are necessary and ongoing but at this time this preliminary owner observational data is encouraging.